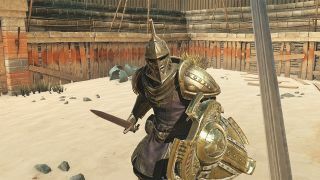 Bethesda opened The Elder Scrolls Blades for testing this week, and it's now letting in waves of the players who signed up for early access. You can still register on the official website but it may be a while longer before you get to try it out. Bethesda says you'll get an email notification once your account is cleared for play. However, I've heard several people (including one who works at GR+) saying they tried out the game and found they could play before they ever got the email. So if you signed up in the past (and have decent wifi) you might as well give it a shot. One big caveat: The Elder Scrolls Blades has an intro cinematic that plays as soon as you load it up, and that rolls straight into a brief combat tutorial. Don't let them get your hopes up. You'll need to sign in with your Bethesda account as soon as the tutorial ends and that's when you can tell if you're cleared to play the whole thing. If you're stuck waiting to play Blades, don't miss your chance to get The Elder Scrolls 3: Morrowind for free, or check out our video guide to stuff you have to see in Skyrim.